U.S. Citizenship and Immigration Services (USCIS) invites you to participate in a stakeholder engagement on Tuesday, November 7, from 1 to 2:30 p.m. Eastern to discuss the Immigrant Investor Program, also known as the EB-5 program. At the EB-5 listening session on July 13, the USCIS participants stuck to their resolve to listen only, and did not provide input or feedback. The call solicited stakeholder comments on the questions raised by the Advance Notice of Proposed Rule-Making, which addressed regional center designation and participation and exemplar project approval. The ANPRM inspired few written comments to its preliminary questions, and this call also got tepid response. What did USCIS want to know from us, beyond what those of us who care said already in our written comments? USCIS would not specify, and we weren’t sure what to say. The Wolfsdorf Rosenthal blog has diligently summarized stakeholder comments, and my recording is available for anyone who’s really interested. I hope USCIS learned something from the call, but I did not. People with more to say on the designated topics of RC life-cycle (designation, participation, termination), RC exemplar process, RC compliance audits, or indirect job creation methodologies may email ipostakaeholderengagement@uscis.dhs.gov. Here is my favorite listening session caller comment, from a Mr. Fuentes in minute 45: “We have a bottleneck of processing in an environment where resources are not the limit.” Yes – that’s exactly what’s wrong and fixable in EB-5. So many problems for EB-5 projects and investors result from the fact of long processing times, and long processing times are traceable to constraints that need not exist in a program of multi-million-dollar projects and high-net-worth immigrants. I’ll write more on this soon. The call also reminded me that we need to talk more about direct EB-5, and the kinds of business and investment that are and are not workable in that environment. Purchasing an operational existing business rarely works for direct EB-5. The history of AAO denial decisions is thick with business acquisition cases that foundered on the “new commercial enterprise” requirement and/or the requirement to create new jobs. EB-5 rules specify that mere ownership change does not make an enterprise or jobs in that enterprise new. I have a couple related posts (one on the difference between direct and regional center EB-5, and one on options for investing in an existing business), but see the need for a simpler article addressed to entrepreneurs contemplating direct EB-5. Immigration lawyers happen to be well-placed to match EB-5 investors to EB-5 projects, and are pressured by the market and tempted with commissions to play a match-making role. This role is perilous, however, considering securities laws. In 2015 and 2016, the SEC made examples of several immigration lawyers who had received transaction-based compensation for facilitating investments, and of one of the regional centers that paid such compensation. The message: it’s illegal to be on the giving or receiving end of payments to someone acting as a broker without appropriate license. One of the law firms targeted by the SEC fought back. Hui Feng (subject of a complaint published in December 2015 by the SEC against himself and his firm Law Offices of Feng & Associates, P.C.) argued that the SEC’s claims fail because EB-5 investments are not securities and the immigration lawyer does not act as a “broker” when receiving finder fees. He pointed out that EB-5 investments are primarily motivated by the visa, without expectation of profit, that his commissions were contingent on visa approval rather than in connection with securities sale, and that the attorney role has its own fiduciary duties and that broker requirements are inapplicable – i.e. the EB-5 process and investment and lawyer’s role are fundamentally immigration matters, not securities matters and not the SEC’s business. (My layman’s paraphrase; see the court filings for the actual legal arguments.) The US District Court, Central District of California, however, has come down on the SEC’s side in its Motions for Summary Judgment (June 29, 2017). The decision has the longest discussion I’ve seen yet in support of the point that yes, EB-5 investments are securities. It also enumerates the activities supporting the conclusion that yes, this immigration lawyer acted as a broker, and explains why the fee arrangement details were material and should have been disclosed to investors and regional centers. If you pay or receive EB-5 finders fees, pay attention to this decision. You may also want to review IIUSA’s Best Practices for Engaging with Sales Intermediaries. USCIS continues to cull the list of approved regional centers, with 50 terminations so far this year. 2017 termination letters haven’t been published yet, but I’ll guess that most of these terminations are for lack of recent activity. In case anyone would like to review it, here is a link to my audio recording and copies of the slides from today’s webinar on the revised Form I-924 Application for Regional Center Designation. (6/2017 UPDATE:You can now get the sound and slides together, as USCIS has posted a recording of the webinar.) The big news was a comment that the page for the March 3, 2017 EB-5 stakeholder meeting now contains remarks from Lori MacKenzie modifying what she had said at the meeting about geographic area amendments. My original blog post complained about this buried new policy posting, but shortly thereafter USCIS sent out a stakeholder email and posted a statement prominently on the EB-5 section of the USCIS website. On March 3, 2017, USCIS held an EB-5 national stakeholder engagement. This national engagement was part of our ongoing effort to enhance dialogue with our stakeholders in the EB-5 program. Remarks from the EB-5 national stakeholder engagement are available here. At the engagement, USCIS noted that a May 2013 policy memo had previously provided guidance that a formal amendment was not required to expand a regional center’s geographic area, and permitted concurrent filing Form I-526, Immigrant Petition by Alien Entrepreneur prior to approval of the geographic scope amendment. The May 2013 guidance was superseded by the recent publication of the final Form I-924 ,the Application for Regional Center Designation Under the Immigrant Investor Program and instructions. The I-924 revisions included changes to the Form I-924 instructions and require that regional centers file a Form I-924 when seeking an expansion of their geographic area. The revised Form I-924 became effective on December 23, 2016, following publication of the revisions in draft form in the Federal Register in May of 2016, and a period during which the public had the opportunity to comment. Where the regional center’s geographic area expansion request was submitted either through a Form I-924 amendment or Form I-526 petition filed prior to February 22, 2017 (the date on which use of the new Form I-924 became mandatory), and the request is ultimately approved, USCIS will continue to adjudicate additional Form I-526 petitions associated with investments in that area under the guidance reflected in the May 30, 2013 policy memo. Any requests for geographic area expansion made on or after February 22, 2017 will be adjudicated under the current guidance; namely, a Form I-924 amendment must be filed, and approved, to expand the regional center’s geographic area. For geographic area expansion requests made on or after February 22, 2017, the Form I-924 amendment must be approved before an I-526 petitioner may demonstrate eligibility at the time of filing his or her petition based on an investment in the expanded area. Form I-526 petitioners who believe they may be unable to demonstrate eligibility at the time of filing on this basis may wish to contact USCIS at ipostakeholderengagement@uscis.dhs.gov. And here, since the I-924 Form and Instructions are apparently our new venue for policy guidance, is the official word on amendment requirements. (2) Change the geographic area of a regional center. (3) Notify USCIS of changes in the name, organizational structure or administration, capital investment instruments, or offering memoranda (including changes in the economic analysis and underlying business plan used to estimate job creation) for a previously added new commercial enterprise associated with the regional center. NOTE: An I-924 amendment is not required to report changes of address, contact information, a change of duties among the regional center principals, changes to non-principal managing companies, contracting agents or similar changes, or information described in Item 2.B. above. The regional center must notify USCIS within 30 days of such changes. Notification of these changes can be made by sending an email to the EB-5 Program mailbox at: USCIS.ImmigrantInvestorProgram@dhs.gov. USCIS will review any changes submitted by email and may require or recommend, as appropriate, the regional center to file an I-924 Amendment. Otherwise, today’s webinar mainly just read through the new Form I-924 content, pointing out changes for the benefit of people who hadn’t previously noted just how much the form changed, or implications of those changes. The audience asked few questions. USCIS emphasized two concerns behind Form I-924 revisions: vetting regional center principals and managers, and limiting geographic area. The revisions take effective steps toward the first objective, but make little difference to the second. Geographic area requests are limited only by imagination and chutzpah so long as USCIS continues to allow and even encourage applicants to base their requests on hypothetical/fictitious projects. Note: The subtext to this webinar may be the storm over IPO’s claim that the revised Form I-924 justifies the new policy to require amendment approval for expanded geographic area prior to I-526 filing. However, the invite doesn’t solicit any advance comments or indicate whether the event will allow questions. U.S. Citizenship and Immigration Services (USCIS) invites you to participate in a webinar on Wednesday, April 26, from 1 to 2 p.m. to discuss the Form I-924, Application for Regional Center Designation Under the Immigrant Investor Program. This webinar will discuss certain changes to the Dec. 23, 2016 edition of Form I-924. Please email ipostakeholderengagement@uscis.dhs.gov with your full name and the name of your organization. Also, please place “I-924 Webinar” in the subject line. Once we process your registration, you will receive a confirmation email with additional details. If you have any questions regarding the registration process, or if you have not received a confirmation email within two business days, please email us at the same address. New Policy: IPO has a new Policy and Performance Division responsible for drafting policy. They’ve been working on revised EB-5 forms (i.e. revised Form I-526 currently out for comment) and on chapters on EB-5 for the in-progress USCIS Policy Manual. Eagerly-awaited policy on the requirement to sustain investment through the period of conditional residence (including the issues of redeployment and what happens to investors in case of regional center termination) will be part of these forthcoming policy manual chapters or amendments to the manual. USCIS will send this policy out in draft form for comment before finalizing it. We can expect to see the draft “in the near future” but “not tomorrow.” Until then, we can look back to the August 2015 draft memo to “see what we’re thinking,” but may also expect changes based on public feedback to that draft and IPO’s consultation with securities professionals. New Regulations: No update on when exactly we may see new regulations published for comment. Compliance: IPO Chief Colucci reports that his office is in contact with Immigration and Customs Enforcement (ICE) and the SEC at least weekly, and again encouraged the public to submit tips on any suspected EB-5-related malfeasance. Contact IPO through the website (https://www.uscis.gov/eb-5) or call the Fraud Detection and National Security (FDNS) team directly at (202) 357-9326. Site visits will generally be at the job-creating enterprise site, unannounced, performed by local FDNS staff, and mostly observational (not necessarily interacting with people on site). Their purpose will be to assess whether what’s happening at the JCE site is consistent with what was proposed/represented to IPO. Regional center audits will generally be at the regional center’s office, announced (by letter and by telephone call to the RC principal), involve interaction with management and staff, and may last a week or more. Their purpose is to assess RC compliance with applicable laws and regulations, and they will be conducted in accordance with generally accepted goverment audit standards. I-829 Interviews: IPO is in a beta/testing phase with I-829 interviews, and developing a strategy for them in response to last year’s GAO report recommendations. Interviewees are currently selected at random. Interviews are conducted by video. It is understood that the petitioner may not have exhaustive info about the investment ready to hand, and petitioners will have opportunity to supplement the record in writing after the interview. Processing: IPO has 25,000+ petitions pending. Premium processing continues unlikely as the Congressionally-mandated fee limit is low enough that nearly all EB-5 applicants could be expected to take advantage of PP, were it offered to them. Meanwhile, prospective investors are apparently starting to wonder whether even a lifetime is sufficient time to complete the EB-5 process. IPO addressed a number of questions on the topic of “what happens if the petitioner dies before I-829 is adjudicated” (short answer: case-by-case determination) and “can someone under 18 apply as the primary petitioner” (short answer: yes and no — not prohibited under the regs but IPO foresees practical issues such as capacity to enter into contracts that are binding on the petitioner). The Commerce Department study commissioned by IPO to assess the EB-5 program’s economic impact is “in the final stages of review” and will be released “in the next couple weeks.” The study covers FY2012-2013, so old news now, but its impact assessments are reportedly higher than estimates for the same period by industry groups (who had less data to work with). Congress has approved funds for IPO to implement a new data system (hooray!) that will allow for better tracking. I won’t bother repeating what Mr. Lyons said about feasibility studies (the obvious – IPO doesn’t require one by default, but may ask for one if the project’s feasibility isn’t established by other means) and pro forma financials (the obvious – that a business plan had better include them). I do appreciate clever Mr. Lawler’s insight into what would encourage Mr. Lyons to repeat himself so we all could hear. Mr. Colucci emphasized that due diligence by regional centers is essential to the integrity of the EB-5 program, and that IPO is focused on regional center responsibility for monitoring and oversight of projects. IPO is translating some EB-5 web content. Matter of R-T-E-R-C-, LLC (JUL152016_01K1610) addresses a grey area for regional center designation – how to justify a request for a certain geographic area. The statute and regs say that a regional center is to be designated for a “limited geographic area,” but naturally applicants want to claim the largest area possible. The common way to accomplish this goal, especially since the May 2013 policy memo, is to formulate a hypothetical project (often flag hotels, because they are easy to write up and pack a fairly wide economic impact) and then hypothetically locate that project at strategically chosen locations throughout the desired geography – strategically chosen so that the aggregate impact areas of each project essentially blanket the desired geography. USCIS has approved many RC applications and amendment requests that use this method, but apparently the amendment request in JUL152016_01K1610 came before a new adjudicator who didn’t feel right about designating a huge geographic area (all of Texas and part of New Mexico) just based on seven hypothetical projects. AAO agreed that “it is particularly challenging to define the geographical scope for a regional center that has only proposed hypothetical projects,” but AAO was compelled by the applicant’s arguments that commuting patterns show that the hypothetical projects would, if real, affect 249 of Texas’ 254 counties, and that worker spending habits and supply chain would also contribute to state-wide impact. AAO also found that “while the Form 1-924 instructions require that the geographic area be contiguous, there is no requirement for an applicant to show contiguous – for example, county-by-county – economic growth throughout the requested geographical area.” The appeal was sustained. The latest AAO decisions on I-526 appeals (JUL072016_01B7203, JUL072016_02B7203, JUL112016_01B7203) continue to press the point that indebtedness only counts as capital placed at risk if secured by the petitioner’s own assets. JUL072016_02B7203 finds that USCIS remarks on indebtedness at the 4/22/2015 stakeholder meeting are a correct reading of relevant statutory and regulatory requirements. JUL112016_01B7203 further argues that remarks at that meeting were not a new rule or new policy, instituted without due procedure, but were just clarifying existing requirements. JUL112016_01B7203 adds a reminder that capital is not at risk if the NCE is overcapitalized (doesn’t show a use for the full amount of investment) and fails to present sufficient evidence of the actual undertaking of business activity (just entering into a lease is insufficient). Additions to the USCIS Regional Center List, 07/05/2016 to 07/27/2016. USCIS will be initiating an IDEA community campaign to collect additional input on EB-5 regulation/policy changes. When that goes live, I’ll post a notice here. I-829 interviews will begin this year, at first virtually, and interviewees may bring counsel, Regional Center representatives, and Regional Center counsel. An audit program for regional centers is being implemented this year, and site visits are being expanded for direct and regional center projects. IPO is up to 126 staff and on track to have 171 employees by year end. IPO did not give any hints about the anticipated content of or timeline for revised regulations or new policy. IPO will work closely with Congress up to the next deadline for regional center program reauthorization (September 30, 2016), and just in case will prepare “what if” guidance for two sunset scenarios: if the Regional Center program lapses but Congress apparently intends to reauthorize it, or if Congress indicates its desire to end the program. IPO Chief Nicolas Colucci reported some preliminary processing data. Q2 2016 receipts: 849 (I-526), 886 (I-829), 40 (I-924). Completions from October 2015 to March 2016 (Q1-Q2 2016): 4,141 (I-526), 1,255 (I-829), 135 (I-924). The big story in these numbers is I-526 receipts, as illustrated in the following figure. The Senate Judiciary Committee’s provocatively titled hearing on The Distortion of EB-5 Targeted Employment Areas: Time to End the Abuse has been rescheduled for Wednesday April 13th. The hearing will be streamed live at the above link. A petitioner can’t get credit for any jobs created by the project if the project didn’t create enough jobs for all EB-5 investors in the project (unless there is an agreement among all investors about how jobs will be allocated). In the MAR252016 case, AAO wouldn’t consider whether any of the 61 new jobs finally claimed could be credited to the petitioner, since there were 11 other EB-5 investors in the project and no job allocation agreement on file. This is not new policy, but an important reminder. Make and file a job allocation agreement, just in case! An EB-5 investment does not meet the “at risk” requirement if the business plan does not “present a comprehensive analysis of the potential net profit available for distribution to each of the limited partners” and therefore fails to “sufficiently establish that there is a reasonable chance for gain, especially in the foreseeable future.” This is not technically a new point (the full “at risk” requirement is “at risk for the purpose of generating a return on the capital placed at risk”), but I haven’t seen AAO/USCIS focus on insufficient profit analysis as a basis for denial. I’ll let you read the MAR252016 decisions for yourself to get the rest of the story. The case also involves the hot issues of troubled business qualification and the separation of ownership, management, and employment among multiple entities, and AAO doesn’t raise all the questions or reach all the conclusions I would’ve expected. What AAO doesn’t say in this case may be as significant as the points that are made. To assist in following the case, I’ve done my best to illustrate the fact pattern (reading around redactions, so mistakes are possible). 2/12 UPDATE: You can now visit the USCIS’s 2/3 engagement page and download copies of the opening statements by Nicholas Colucci, Julia Harrison, and Lori MacKenzie, which were the most informative part of this engagement. Ron Klasko and Jessica DeNisi have a good summary on the IIUSA blog of significant content. I’ve uploaded my recording of today’s EB-5 Immigrant Investor Program Stakeholder Engagement with USCIS, though I do not particularly recommend it. If you want an interesting and information-rich update, look at IPO Chief Colucci’s written testimony for yesterday’s judiciary committee hearing. We appreciate having stakeholder engagements with open Q&A, and practitioners will benefit from reviewing the updates and the answers that were given and withheld, but overall I didn’t learn much from the meeting. The next EB-5 engagement will be held on April 25 in Washington DC, with opportunity for in-person attendance. In case you missed today’s EB-5 stakeholder meeting, here is a link to my recording. The recording sound quality is not my fault; that’s how it sounded on the phone too. (Also, Peng & Weber have typed up a transcript of part of the meeting.) UPDATE: USCIS has posted opening statements. Here is a link to the Government Accountability Office’s newly-released report “Immigrant Investor Program: Additional Actions Needed to Better Assess Fraud Risks and Report Economic Benefits” (August 2015). Both the meeting and the report give an interesting look into details of actions already taken to protect and improve EB-5 program integrity. Congress may be busy vacationing and not passing bills, but agencies are still making change happen. The meeting did not reveal much about the draft policy memo, except to show that USCIS is as much at sea as everyone else when it comes to the practicalities of applying an investment requirement that’s divorced from job creation, and thus divorced from the governing logic of the EB-5 program and existing guidance for the parameters of acceptable EB-5 investment. Apparently USCIS plans to add more detail and clarification to the final memo, but hasn’t yet figured out how to clarify the sustainment issue. Stakeholders were repeatedly invited to submit their suggestions. The GAO report is worth reading, being well researched and much more serious and thoughtful than the narrowly political and personal-grievance-fueled March 2015 OIG report. Don’t forget to dial in today at 1 pm Eastern for the USCIS EB-5 stakeholder teleconference. Here are other good conferences and webinars to keep in mind, if you’re seeking quality (and often free) EB-5 information and networking opportunities. Please email to alert me of good EB-5 webinars that I’ve missed in this list. We heard from three members of Congress: Senator Ron Johnson (R-WI), Hon. Zoe Lofgren (D-CA19), and Hon. Darrell Issa (R-CA49). Senator Johnson encouraged us to fight the cultural tendency to cartoonishly villainize business and success, but he didn’t seem as eager to support the immigrant part of immigrant investment. As chair of the Senate Homeland Security and Government Affairs Committee, he has formulated a strategic plan that is all about securing borders and defending against threats, with no bullet points related to the welcome mat aspect of immigration. Lofgren and Issa did promise to support Regional Center Program reauthorization, with changes, and referred back to their respective (now dusty) IDEA Act and Skills Act proposals. Lofgren and Issa agreed that the qualifying investment amount needs to be increased and that it would be nice, if tough, to increase the visa cap. IIUSA’s advocacy panel discussed the climate in Congress generally and opined that program reauthorization is likely, but that it will likely be another extension rather than permanency, and will likely involve changes to the minimum investment amount, TEA process, and additional oversight provisions. Apparently the executive actions on immigration quelled Congress’ appetite to discuss immigration issues, especially across the aisle, and many members are unwilling to consider any other immigration measures until the executive action issues have been dealt with. Panel discussions suggested that mainland China is still basically the only choice for large EB-5 capital raises (e.g. over about $20 million), because it’s the only country with infrastructure in place, though an increasing variety of other countries have supplied EB-5 investors in recent years. A change to the licensing procedure for migration agents in China has resulted in a proliferation of new agencies (over 2,000). However agencies dealing with immigration in China do still need to be licensed, and foreign parties cannot obtain such a license or legally do their own advertising or seminars in China. Provincial Entry & Exit associations continue to help oversee and organize migration agencies. The Guangdong association for example, provides training and screening and even publishes rankings for member agencies. The panel of representatives from Chinese migration agencies noted that the market for EB-5 investments in China is still strong, and that they do not anticipate demand reduction in response to the China EB-5 cut-off date or the possible increase to the EB-5 investment amount. For additional info on the China market, note recent posts on the Klasko Law Blog. If only the panel with Catherine DeBono Holmes, Michael Homier, Ozzie Torres, and Lili Wang had lasted another hour or so. Such timely and critically important information! Homeier discussed the SEC’s crackdown on receipt of broker fees by unlicensed persons. The SEC has reached settlement agreements with a number of attorneys (with an announcement naming 15-25 firms expected soon), and the likely next step is SEC cases against any Regional Centers that paid impermissible finders fees. Torres reminded the audience that our SEC panelist from the previous day basically said that there is no such thing as a finders exemption. (From my notes: C. Joshua Felker called the so-called finder’s exemption “a popular belief.” He stated that somebody called a “finder” is actually a broker assuming his activity matches the defined activity of a broker, and that foreign “finders” can only be compensated as such if they provide a name only and give no investment advice.) Of course attorneys can get paid for legal services, but they cannot get paid to refer a client to a Regional Center, and they’d be wise to generally avoid transaction-based compensation, which attracts SEC attention. The panelists discussed possible exemptions to broker-dealer registration and ways to involve broker-dealers in the process of selling EB-5 investments. For better summary than I can give of the securities law details, see Catherine DeBono Holmes’ articles on the Investment Law Blog. Here is the PDF copy of the booklet Regional Centers & Sponsors and U.S. Securities Laws that Cathy was giving away at the conference. IIUSA unveiled an economic impact study of EB-5 Regional Center investments from 2010 to 2013. The report was prepared by David Kay of the Alward Institute for Collaborative Science, and uses a comprehensive data set thanks to the FOIA process, which allowed IIUSA to obtain redacted copies of Form I-924a filings for all Regional Centers. I’ll link to the summary report and charts when IIUSA posts information. The short story is that during FY2013, spending associated with Regional Center investors contributed $3.58 billion to U.S. GDP and supported over 41,000 U.S. jobs. Not bad! The impact study breaks down impacts by spending category and by geography, down to the Congressional District level. 329 I-924 Regional Center applications are currently pending at USCIS. I-526 investor petition filings showed a 50% increase in 2014 over 2013 (which had about as many receipts as 2012). 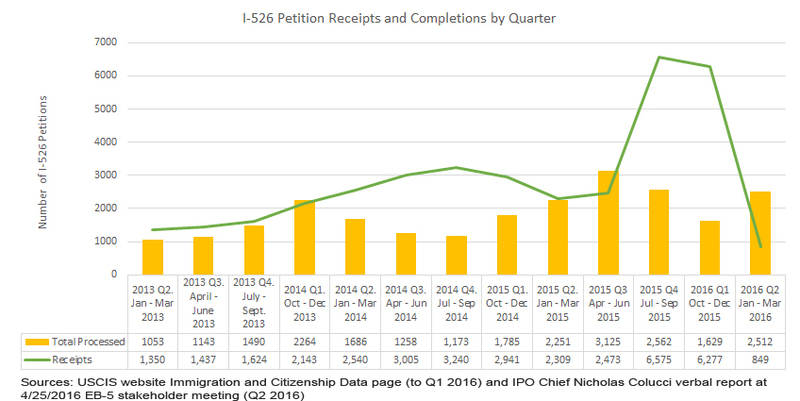 In FY2015, USCIS received over 5,200 I-526 petitions by the end of March. As of the end of March, USCIS had 585 I-526 petitions with a Request for Evidence pending, 629 petitions with decision pending after response to RFE, and over 400 I-526 petitions with an outstanding Notice of Intent to Deny. USCIS currently averages, per month, about 800 I-526s received and 630 I-526s processed. That means that the backlog of I-526s awaiting adjudication — already at a faint-worthy 13,027 petitions – is growing as receipts regularly exceed decisions. USCIS’s plan to address the backlog, as reported to the Ombudsman, involves adding staff and approving overtime. Ms. Odom said that IPO presently has 54 adjudicators, 18 economists and 12 program analysts, and plans to add 25 more staff by the end of the year. (She also commented that this plan hardly seemed equal to really addressing the backlog). Ms. Odom noted the effect of USCIS’s Quality in the Workplace initiative, which replaced quantitative with qualitative goals – a good move for employee morale but creating challenges for setting goals related to number of petitions adjudicated. USCIS’s promised policy memo related to retrogression is reportedly in final process, but apparently, mysteriously, the memo will not focus on the specifics of retrogression but rather on the issue of what constitutes material change. Oh well, material change is an important issue too. Ms. Odom’s understanding is that the much-questioned 2.5 year job creation window, stated in the May 30, 2013 policy memo, will be reiterated in the forthcoming memo. No word on whether the new memo may cover questions related to sustaining the capital investment or priority dates and child status issues. We are reminded that the CIS Ombudsman serves as “an office of last resort” when there are EB-5 case problems. If you have a case that’s pending 60 days over posted processing times (or presents special issues) and you’ve already tried contacting USCIS about the problem, you can go to the Ombudsman. See http://www.dhs.gov/case-assistance. Charles Oppenheim, Chief of the Department of State’s Visa Controls Office, announced a May 1, 2013 cut-off date for mainland China-born EB-5 visa applicants. (You can also read this news, with commentary, in the Visa Bulletin for May 2015.) Per-country limits kick in when DOS foresees running out of visa numbers for the year – a new problem for the EB-5 program, which historically didn’t get close to using its annual allocation of around 10,000 visas. Now demand is up and we have our first cut-off date (affecting mainland China-born applicants, because they use a disproportionate number of EB-5 visas). Starting next month if you (and your spouse) were born in Mainland China and you get approval of an I-526 petition filed sometime after May 1, 2013, you can’t move forward in the visa stage of the process until DOS advances the cut-off date. (Everyone else is not affected.) Mr. Oppenheim anticipates advancing the cut-off date gradually, at least in conjunction with the new visa allocation that will come with the new fiscal year starting in October. It’s also possible that he might move the cut-off date back (which I learned is the only part of this process that’s accurately termed “retrogression”) if visa numbers prove even more limited than expected (which might happen if USCIS does improve its processing speed and volume). We’re encouraged to keep an eye on Item D in the monthly Visa Bulletin for periodic updates on movement of the cut-off date. The current cut-off date involves a wait of about two years (not terribly onerous, considering how long people have to wait for I-526 processing anyway), and demand trends suggest a wait of more like three years by the end of 2016. Panelists David Hirson and Bernard Wolfsdorf (and Robert Divine) pushed for clarification on procedural questions related to securing priority dates for child status protection, and Mr. Oppenheim promised that his legal department would be addressing such questions in a memo to be released in the next few days. (He may also have answered the question himself, but you’ll have to ask Mr. Hirson to translate into English!) Mr. Oppenheim also mentioned that visa usage is about 45% principals (investors) and 55% derivatives (spouse/children) – rather different from the 1/3 to 2/3 breakdown that I’ve heard previously. He warned specifically against trusting bloggers for visa advice, but nevertheless I’m repeating links to posts that I found helpful from Robert Divine and Ron Klasko. We got nice presentations from C. Joshua Felker (SEC Enforcement Division Assistant Director) and James Wrona (FINRA VP and Associate General Counsel) on the relevance of their agencies for EB-5 – but no breaking news that I could perceive. Felker mentioned five EB-5 enforcement actions but only named the three from 2013/2014. He did not discuss the forthcoming action involving some fee-taking immigration attorneys (see EB-5 Analytics for discussion of this important topic). The issue of whether/when a Regional Center may need to register as an investment adviser was also not really addressed (see Holmes & Shum’s recent article for discussion of this important topic). We got the usual reminders that SEC enforcement interests do cover registration issues as well as fraud, and that something that acts like a security is a security (and that acts like a broker, is a broker) regardless of what they’re called. I learned from Wrona that FINRA currently has about 60 broker-dealers engaged in EB-5 activity, a marked increase from previous years. The number of broker-dealers at the conference reflect this welcome trend. As we know, FINRA guidelines that particularly overlap with EB-5 include the suitability rule (which must consider both investment and immigration suitability for EB-5 per the Trustmont letter), the advertising rule, Bank Secrecy Act issues, and anti-fraud issues. There are a few lessons for businesspeople offering EB-5 investments. First, do be serious about vetting your investors, assuming you don’t want to end up some day with unsavory connections and cameras chasing you down a hallway. USCIS, the State Department, OFAC and their partners are much more serious and meticulous about vetting EB-5 petitioners than the ABC reports imply, but still you can’t be too careful with your own screening. There are terrorists and spies and cheats in the world, but people are not terrorists because they’re Iranian and are not spies and cheats because they’re Chinese, despite ABC’s implications. FYI: EB5info has posted a copy of the memo referenced in the story, and IIUSA and Klasko Law have issued reaction statements. A reminder that this is the last week for early bird registration for IIUSA’s 8th Annual EB-5 Regional Economic Development Advocacy Conference on April 12-14 in Washington D.C. We’ll have a lot to advocate about this year. I have started a new Frequently Asked Questions page that compiles official and unofficial USCIS answers to questions that affect business plans. So far I’ve linked in answers from USCIS policy guidance and stakeholder meetings, and I’ll be adding references to AAO decisions that treat sticky business plan questions. Speaking at the IIUSA conference on October 23, Charles Oppenheim predicted that the EB-5 visa category will likely retrogress in July 2015. This remains a moving target, however. Ron Klasko’s blog has published a timely article on Surviving and Thriving in Times of EB-5 Quota Backlogs. You may thank us at the IIUSA editorial committee for another great edition of the Regional Center Business Journal (October 2014). Three feature articles provide advice and analysis for I-829 petitions: The Latest Analysis of What USCIS Looks For in EB-5 I-829 RFEs and Denials, It’s Never Too Soon to Begin Preparing for I-829 Petition Filings, and Removal of Conditions for EB-5 Investors: Practical Guidance in Preparing I-829 Petitions. The USCIS website has a sharp new look as of last week, but no new EB-5 content except a IPO processing times update. I-829 times are back to normal, while average I-526 and I-924 processing times continue to inch up. Mark your calendars for IIUSA’s 2015 EB-5 Regional Economic Development Advocacy Conference on April 12-14, 2015 in Washington, DC. To those in San Francisco this week for the 2014 IIUSA EB-5 Market Exchange, happy deal-making! I’m not able to make this conference, but send best wishes and look forward to sharing feedback from attendees. To those stuck behind a desk this week, I recommend you to the virtual EB-5 masterclass that is AILA’s new Immigration Options for Investors & Entrepreneurs, 3rd Ed. I received a free copy as a contributing author (I wrote the chapter on EB-5 business plans), but can now testify that the book is worth the full price ($129 for AILA members, $199 for the rest of us). This is not a collection of quick opinions, general introductions, and veiled advertising but a set of serious articles that incorporate comprehensive research and extensive experience. If I were an immigration attorney working with EB-5, I’d buy the book for the sample documents and case materials alone, not to mention excellent articles such as Estelle McKee’s practical discussion of issues in demonstrating job creation in I-829 petitions and Carolyn Lee’s definitive analysis of the at-risk requirement. (And Suzanne Lazicki’s lucid treatment of the EB-5 business plan!) If I were an investor or offering EB-5 investments, I probably wouldn’t buy the book for myself (it’s specialized and heavy) but I would make sure that the attorney representing me had a copy. The book works hard to make good on its promise “to provide everything you need to successfully represent clients in this highly specialized area.” Click here to preview the Table of Contents, and update your Christmas list as needed. I expect to have important updates shortly, as USCIS is overdue to update Q4 2014 petition processing statistics, and the State Department may come out with the Report of the Visa Office 2014 any day. 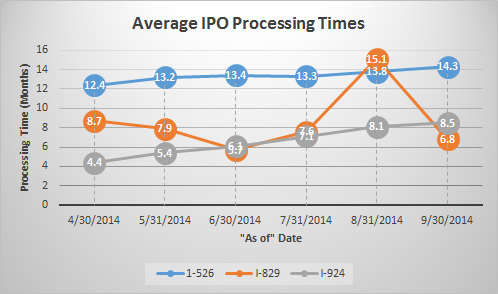 For now, we just know that average processing times are holding steady for I-526 (13.8 months) and I-924 (8.1 months), and have shot up for I-829 (to 15.1 months, likely in connection with the transfer from California to Washington DC). Those interested in Targeted Employment Area issues should note the new approach to TEA designations adopted by California, which has tended to be a trendsetter. Meanwhile, USCIS continues to add and subtract Regional Centers from its list (and continues to fail to update its FOIA reading room with designation letters for the Regional Centers approved since 2012). U.S. Citizenship and Immigration Services (USCIS) invites you to participate in a stakeholder teleconference on Wednesday, Sept. 10, from 2:30–4 p.m. (Eastern) to discuss the EB-5 Immigrant Investor Program. During this teleconference, USCIS officials will share EB-5 Immigrant Investor Program updates and respond to your questions. Visit the USCIS Public Engagement registration page to confirm your participation.